Sinkhole-related repairs will result in the closure of one southbound lane of Lafayette Street to be closed between Calle de Luna and Highway 237 from 7 a.m. to 5 p.m. March 25 and March 27-30. During the same timeframe, and one northbound lane will be closed. On March 26, both southbound lanes on Lafayette Street will be open after 12 noon to accommodate residents as a result of the stadium event. Both southbound lanes on Lafayette Street will now remain open on Saturday, March 23. Beginning Monday, March 25, through the week, there will be a temporary closure of one southbound lane on Lafayette Street, between Calle De Luna and Highway 237, from 7 a.m.-5 p.m. The one northbound lane on Lafayette St. remains closed. On these days, the City’s contractor will use an excavator to load trucks hauling dirt from the area. The one northbound lane on Lafayette St. between Calle De Luna and Hwy 237 remains closed. Since Sunday night, March 17, a 4 foot by 4 foot sinkhole prompted the lane closure as the City assesses the damage and conducts repairs. The sinkhole was caused by a 42-inch sewer line that had a break. Since there is extensive work involved in replacing the sewer line, it will take some time for the work to be completed. For more information, contact Water & Sewer Utilities at 408-615-2000 or email water@santaclaraca.gov. UPDATE - One northbound lane of Lafayette Street between Calle De Luna and Hwy 237 has reopened. 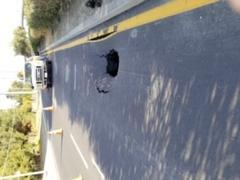 However, one northbound lane remains closed due to the sinkhole. Traffic is delayed in the area as a result. Please avoid the area, if possible. The public is being advised to avoid a portion of Lafayette Street in north Santa Clara for the time being due to a sinkhole. The northbound lanes of Lafayette Street between Calle De Luna and Highway 237 are temporarily closed as crews assess the situation. If you’re in the area, please follow detour signs. According to the City’s Water & Sewer Utilities staff, the 4 foot by 4 foot sinkhole was caused by a 42-inch sewer line that has a break. Fortunately, there were no sanitary sewer overflows to the street or storm drain. Crews are on the scene now but no word on how long it will take to make repairs. Updates will be shared as new information becomes available.